M3m City Hub: An iconic commercial destination where class meets perfection! Gurgaon is an incredible city and a part of the National Capital Region that is growing like no other. The real estate market in Gurgaon is booming today with a number of commercial and residential projects throughout the city. M3m City Hub is the latest commercial project in Gurgaon by M3M Group that offers the best commercial spaces and shopping experience that people in Gurgaon have ever been through. Extended over 14 acres of land, this A-class commercial development contains a 12 screen multiplex, large food court and plenty of retail stores. With area sizes starting at 500 sq. ft. and going up to 2000 sq. ft., there is plenty of luxury space for every brand and business at this prime development. The ultimate shopping and hang-out destination is what M3M City Hub Gurgaon truly is. This development is inspired by European architecture and is host to plenty of Indian and Internal brands that are loved by many. With commercial space of different sizes, there is a perfect space to meet the requirement of every brand/business out there that is looking for high profits and better returns each day. This commercial development is not only a mega shopping destination that is crafted to perfection, but also a place for people to spend time with loved ones, friends to hangout and have a good time. The massive food court offers a range of treats and delicacies so that nobody goes back home with an empty stomach and all shoppers rejuvenate themselves and get back to shopping. An experience at this commercial development is never short lived and once you step in, you will never want to step out. M3M has made every shoppers dream come true with this outstanding commercial project of pure luxury and comfort. This development also provides swift elevators, power back for emergencies, Wi-Fi connectivity, a play-area for kids and high-end security with video surveillance for total safety. 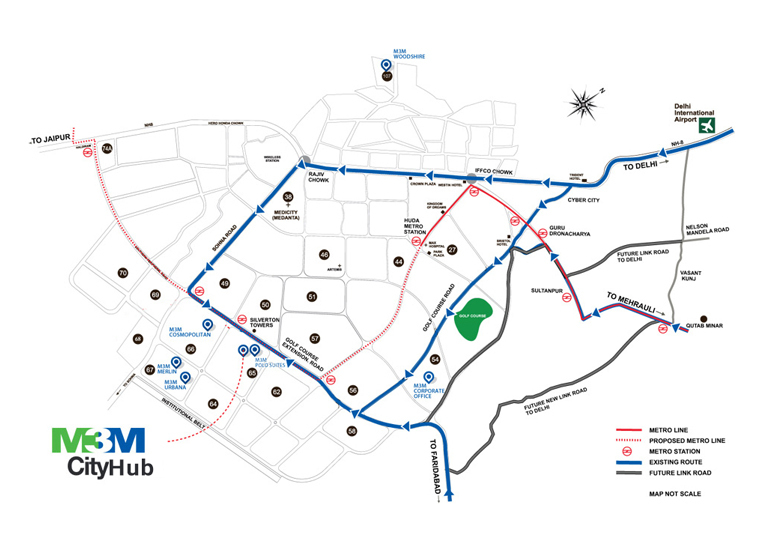 Located at Sector 65 in Gurgaon, M3M City Hub Sector 65 comes in close proximity to a number of places like hospitals, banks, ATMs, petrol pumps, all kinds of public transport and also offers easy connectivity to other parts of the city. The beauty and strategic location of this development makes it very hard for people to pass by visiting it. This ensures better visibility of brands/businesses and higher returns at the end of the day. The M3M City Hub price list is totally worth the supreme features and future returns that it has to offer at the end of the day. There are different payment plans that you can choose from along with commercial loans at low interest rates and more. M3M City Hub, European Style Highstreet Retail, Superplex and Luxury Residences.